Eighty-four years ago on October 31, 1926, Harry Houdini died at 1:26pm in a Detroit hospital from peritonitis. Not only is today celebrated as Halloween, but magicians around the world recognize it as National Magic Day, named in honor of the great escapologist. 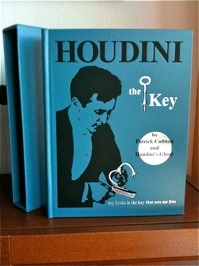 What better day than Halloween to announce the publication of HOUDINI - THE KEY, Patrick Culliton’s major new book which reveals many of Houdini’s most closely guarded secrets. I’ve just picked up my copy (#25) and I can tell you the book is a stunner! It’s a mammoth 460 pages, profusely illustrated, and comes in an attractive slipcase. 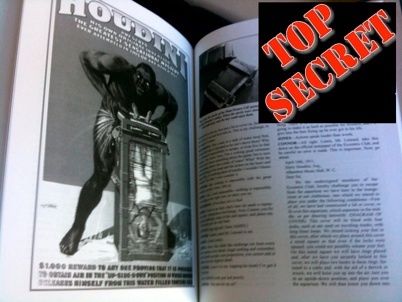 There are many photos I’ve never seen, including a rare shot of Houdini and Boudini in their challenge shackles and bathing suits, and sequential stills from rarely seen footage of Houdini performing the Thumb Racket. Also revealed, in photos, are the working methods of Metamorphosis, the Milk Can, and the Water Torture Cell. Patrick will start shipping the book tomorrow to those who have pre-ordered. The release is limited to only 278 copies (with a majority already sold out). 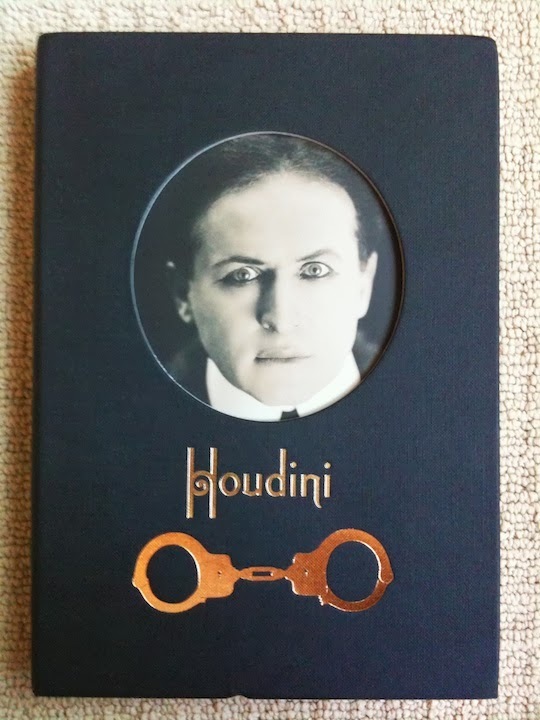 If you act quickly you can still get a copy of Houdini - The Key for $195 + $12 shipping. Visit Houdini's Ghost for details on how to order. The secret of the Water Torture Cell REVEALED! 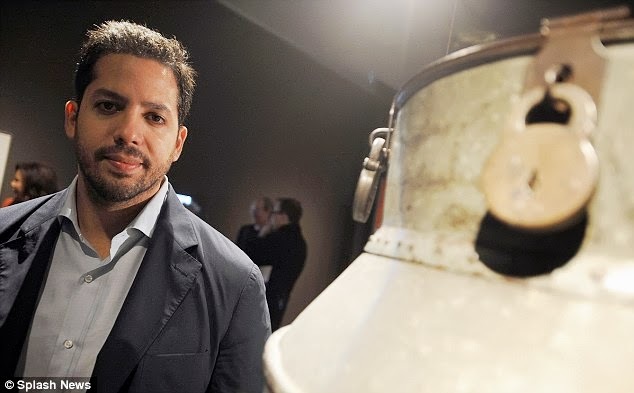 David Blaine helped open the new exhibition, Houdini: Art and Magic, at the Jewish Museum in New York City today by demonstrating Houdini’s famous handcuff escapes for children. Click here for photos from today’s opening event. 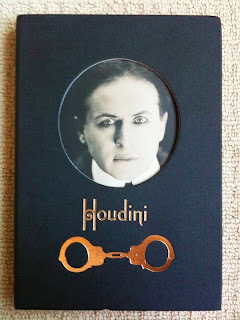 For more information on Houdini: Art and Magic visit the Jewish Museum website. A beautiful companion book to the exhibition can be purchased at Amazon.com . HOUDINI ART AND MAGIC, the first major art museum exhibition to examine Houdini’s life, legend, and enduring cultural influence, opens today at The Jewish Museum in New York City. Through 163 objects, exhibition visitors will be able to explore the career and legacy of the celebrated entertainer while considering his lasting impact on contemporary art and culture. 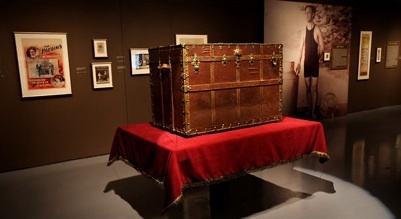 Magic apparatus – rarely exhibited together – handcuffs, shackles, straitjacket, a milk can and a packing trunk are showcased in the context of their original presentation. A recreation of the famous Water Torture Cell (much of the original was destroyed in a fire in 1995) is also on view. 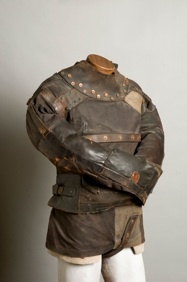 Two of Houdini’s private diaries, never before shown in a public exhibition, are on display. Also included are 26 recent works of art in a variety of media by such artists as Matthew Barney, Jane Hammond, Vik Muniz, and Raymond Pettibon; historic photographs; dramatic Art Nouveau-era posters and broadsides; theater ephemera; and archival and silent films that illuminate Houdini’s role as a world-famous celebrity who commanded a mass audience in the late 19th and early 20th centuries. The exhibition is drawn from private and public collections, including The Museum of Modern Art, New York; the Museum of the City of New York; the Library of Congress, Washington, D.C.; the Harvard Theatre Collection, Cambridge, Massachusetts; The New York Public Library; The History Museum at the Castle, Appleton, Wisconsin; The National Portrait Gallery, Smithsonian Institution, Washington, D.C.; the Whitney Museum of American Art, New York; the Harry Ransom Humanities Center, University of Texas at Austin; and Tate, London. Following its New York City showing, Houdini: Art and Magic will travel to Skirball Cultural Center, Los Angeles, CA (April 28 – September 4, 2011); Contemporary Jewish Museum, San Francisco, CA (September 30, 2011 – January 16, 2012); and Madison Museum of Contemporary Art, Madison, WI (February 11 – May 13, 2012 ). Houdini: Art and Magic has been organized for The Jewish Museum by guest curator Brooke Kamin Rapaport. Gabriel de Guzman, the Museum’s Neubauer Family Foundation Curatorial Assistant, has served as exhibition coordinator. Museum hours are Saturday, Sunday, Monday, and Tuesday, 11am to 5:45pm; Thursday, 11am to 8pm; and Friday, 11am to 4pm. Museum admission is $12.00 for adults, $10.00 for senior citizens, $7.50 for students, free for children under 12 and Jewish Museum members. Admission is free on Saturdays. Visit The Jewish Museum website for more information. 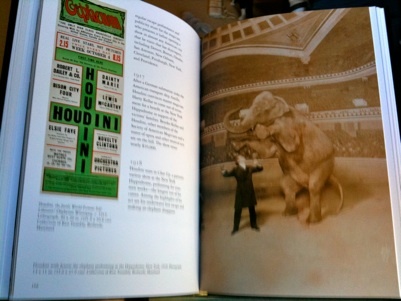 A 288-page companion book to Houdini: Art and Magic can be purchased at Amazon.com . The companion book to Houdini: Art and Magic , the first major art museum exhibition to examine Houdini’s life (which opens tomorrow at The Jewish Museum in New York City), is now in stock at Amazon.com . This gorgeous 288-page hardcover book with a die-cut cover contains 157 color and 45 black and white illustrations, some never before published. Essays on Houdini’s life and work are accompanied by interviews with novelist E.L. Doctorow, Teller (of Penn and Teller), and contemporary artists including Matthew Barney (The Cremaster Cycle). The book also includes contributions by Houdini biographer Kenneth Silverman and the exhibit curator Brooke Kamin Rapaport. 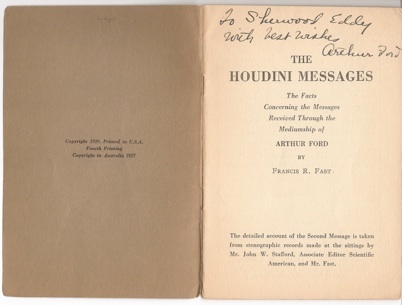 Houdini: Art and Magic is funded through the Dorot Foundation publications endowment and co-published by The Jewish Museum and Yale University Press. 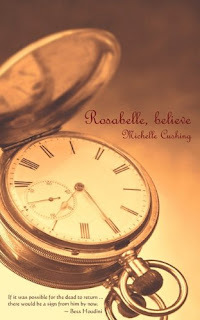 Not to be overlooked in all the big Houdini news this week is the very intriguing new book, Rosabelle, Believe by Michelle Cushing, due to be published on Halloween (but shipping now from Amazon ). A tale of love so great it transcends death. A believer in magic, poet Eric Pilot - a man filled with so much love that his dark eyes literally flicker - believes he is the reincarnation of Harry Houdini. See, Eric believes death is a ruse, life's one incredible magic trick, and he has only one goal - to be reunited with his beloved. On a train bound for Hot Springs, Arkansas, he meets another master of illusions, reserved archivist Dawn Corner, a woman who spent her life fermenting on a vineyard with an unloving family. She has no concept of magic. Not a single belief. Not one thought or inclination. Eric, however, is a man of stupendous magic, and he ignites an ember within her. As a newfound fire rages inside Dawn, she begins to believe in magic too. But will she ever be able to accept that Eric is the reincarnation of Houdini ... and she is his wife Bess? In her third novel, Michelle Cushing follows in the footsteps of other lyrical, Southern writers such as Tennessee Williams and Eudora Welty. "Rosabelle, believe" ignites like flint against steel, taking readers on a journey as alive and fragrant as a green leaf in spring. It is a story of two unique, tragic characters - one cold like funeral black, the other pure fire - trying to find a balance between mystical and logical, light and dark. Join them as they meet in a place where love's clever sleight of hand spans beyond conventional time. You can read an online excerpt from Rosabelle, Believe HERE. The Forrest of Mirrors, a popular Halloween haunted house held in the former home of Buster Keaton in Woodland Hills, California, will this year include a Houdini-themed surprise. NBC reports that owner and “Halloween fanatic” Philippe Bergeron, who has been hosting this haunted house for several years, just recently discovered the connection between Houdini and the previous home-owner. “A year ago, I wondered what if there was a relationship between Buster Keaton and Harry Houdini, I Goggled the two names and discovered Houdini was the godfather of Buster Keaton,” said Bergeron. Bergeron says this year his haunted house will include a nod to Houdini, but he is keeping secret exactly what that surprise will be (see clip below). Okay, I have plans on Halloween, but I’m going to do my best to get out to Woodland Hills and see this. This sounds like fun on many levels! You can check out “The Forest of Mirrors” in Woodland Hills at 6124 Lederer Avenue. It’s open free to the public Halloween night 6pm to Midnight. Visit their website for more information: www.forestofmirrors.com. Blaine seemed captivated by the jerky black and white movie clip, projected a few steps from the entrance to the exhibit, showing Houdini wriggling out of a straitjacket. He was hanging upside down over a crowd, as he so often was. "I don’t know anybody who does anything like this today," Mr. Blaine said with what sounded like unbridled admiration. On the screen, Houdini twisted, writhed and popped free of the straitjacket. Mr. Blaine stood still, watching. The clip played again. "Watch him struggle," Mr. Blaine said. "It's almost beautiful — the beautiful struggle." The Daily Mail also has coverage of the day with many pics from the exhibit itself. 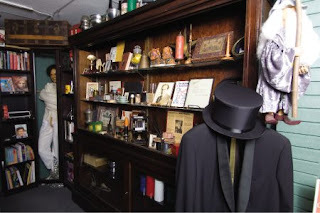 Visit The Jewish Museum website for more information on Houdini: Art and Magic. Winnipeg - On Friday Oct 29, 2010 at 7:00 P.M. Escape artist Dean Gunnarson will attempt his most difficult, daring, and challenging escape of his career. 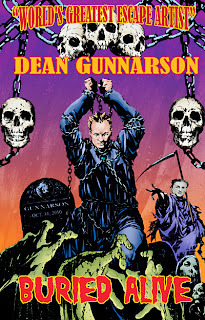 Gunnarson will be chained, locked, and bound and placed inside a steel coffin. The lid will be locked on and wrapped in even more chains and locks on the outside. The coffin, with Dean securely locked inside, will be lowered 6 feet underground and he will be buried alive with over 3 tons of dirt dumped on top of him. 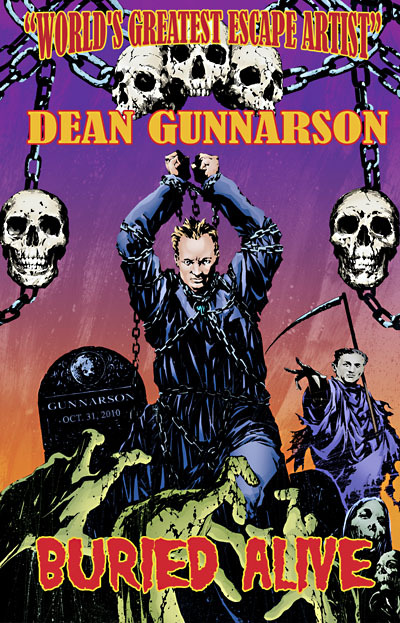 Gunnarson must survive two days underground locked in the coffin with no food or water and without panicking or going insane. Dean will then attempt to escape on Sunday Halloween Day around 1:26 P.M. The exact day and time the Great Houdini died in 1926. Will Dean survive this underground hell or will he get his boy hood wish of dying the same day his mentor did? Houdini wrote in his diary that this escape was "very dangerous" and that "the weight of the earth is killing." He vowed never to even attempt it! "I know that from a physical and mental stand point this will be my most challenging escape ever," said Gunnarson. "The last time I was locked in a coffin I died. I never wanted to be in another one and I never have. 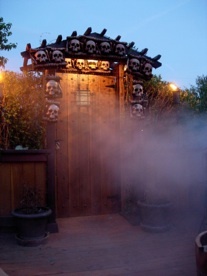 I will have to conquer all my personnel fears and demons to make this escape on Halloween." Gunnarson is referring to his failed coffin attempt back on Halloween 1983. He was underwater for nearly 4 minutes before the coffin was raised back out of the murky waters and rescuers found his blue lifeless body. Winnipeg Paramedics rushed him to the Health Science Center where they brought him back to life. Even though that escape nearly cost him his life, it made Dean even more determined to do what others said was impossible. Since then Dean has travelled the world performing his amazing and death-defying escapes to millions of people in China, Japan, Iceland, India, Egypt, Europe, South America, U.S.A. and Canada. Recently returning from China, where he was filming a TV special, Dean was hit by a speeding roller coaster at over 100 km's while leaping from the tracks after being chained to them. Dean suffered a broken foot and some internal bleeding but said, "It all goes along with the job." This Halloween Gunnarson will attempt to take his escapes to a new depth. "I have seen the lights at the end of the tunnel and now I will experience a living Hell for 2 days. I am glad it's happening in my home town of Winnipeg and everyone can come cheer me on. I will need all their help this time!!!" Some potentially good news here. 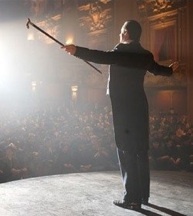 Hugh Jackman says the Broadway Houdini musical, which was first announced way back in April 2008, is moving forward. Here’s something I don’t think I’ve ever heard before. 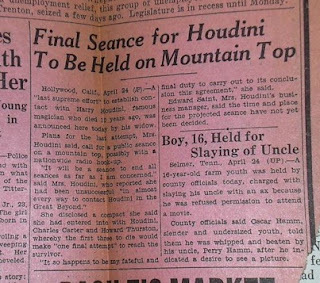 Bess Houdini and Ed Saint originally announced that the tenth and final Houdini seance would be held on a mountain top. 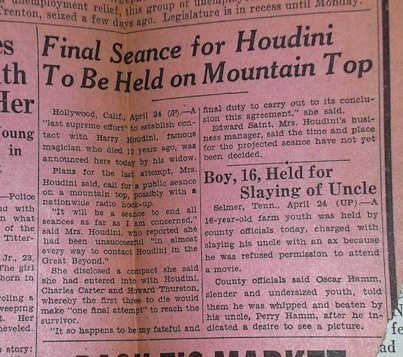 You can hear a recording of the full Final Houdini Seance HERE. So what do Houdini and Archie Bunker -- the outspoken head of household played by Carroll O’Connor in the classic ‘70s sitcom All in the Family -- have in common? Turns out both are “spiritual” residents of Glendale, Queens. 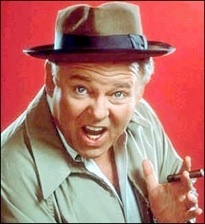 An article in today’s AM New York profiling the community of Glendale, points out that the neighborhood is not only home to Houdini’s family plot in Machpelah Cemetery (this we knew), but it is also home to Archie Bunker’s House. The house, featured in the show’s opening credits, is not in Astoria as the show suggests, but sits on a quiet street in Glendale across from St. John’s Cemetery at 89-70 Cooper Ave. So there you go. Now you have TWO things to see when you visit Glendale. Read A Visit to Glendale: The Teutonic turf of Archie Bunker and Harry Houdini at AM New York. New York, NY - In conjunction with its new exhibition, Houdini: Art and Magic, The Jewish Museum is presenting two related programs. Conjuring Houdini in the Popular Imagination, a panel discussion featuring magicians George Schindler and Dorothy Dietrich and Houdini biographer Kenneth Silverman will take place on November 11. A conversation with distinguished author E. L. Doctorow and historian Alan Brinkley on Doctorow’s interpretations of Harry Houdini will be offered on November 18. More than 80 years after his death, escape artist extraordinaire Harry Houdini continues to fascinate and inspire. 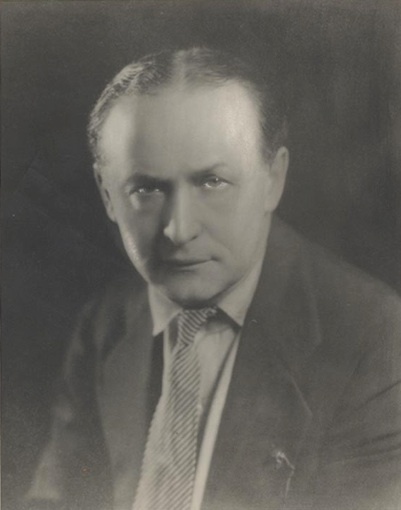 “Dean of American Magicians” George Schindler and "The First Lady of Magic" Dorothy Dietrich join Houdini biographer Kenneth Silverman to discuss why the legendary magician occupies such a prominent place in American popular culture. The evening will include archival footage of classic Houdini escapes and a special live recreation of his signature straitjacket escape. George Schindler is a member of the Society of American Magicians’ Hall of Fame, starred as "Chandu the Great" in Woody Allen's New York Stories (1989), and is the author of several books. Dorothy Dietrich has been called “the female Houdini” and is one of the first women to achieve fame as a magician. Kenneth Silverman’s books include Houdini!!! ; Begin Again: A Biography of John Cage, A Cultural History of the American Revolution; The Life and Times of Cotton Mather (winner of the 1984 Pulitzer Prize for Biography); Edgar A. Poe: Mournful and Never-ending Remembrance; and Lightning Man: The Accursed Life of Samuel F. B. Morse. Tickets: $15 general public; $12 students/over 65; $10 Jewish Museum members. Distinguished author E.L. Doctorow discusses his interpretations of Harry Houdini in his National Book Critics Circle Award winning novel, Ragtime, with noted historian Alan Brinkley. E.L. Doctorow’s novels include The Book of Daniel, a National Book Award nominee in 1972; World’s Fair, winner of the 1986 National Book Award; Billy Bathgate, winner of the PEN/Faulkner prize, the National Book Critics Circle Award and the William Dean Howells medal of the American Academy of Arts and Letters, 1990; and The March, which received the 2006 PEN/Faulkner Award, the 2006 National Book Critics Circle Award and was a Pulitzer Prize finalist. He holds the Lewis and Loretta Glucksman Chair in English and American Letters at New York University. Alan Brinkley is the Allan Nevins Professor of History and former Provost at Columbia University. 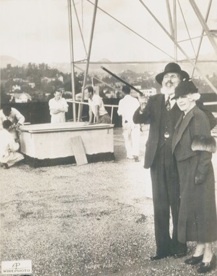 He is the author of Voices of Protest: Huey Long, Father Coughlin, and the Great Depression, which won the 1983 National Book Award; The End of Reform: New Deal Liberalism in Recession and War; Liberalism and its Discontents; Franklin Delano Roosevelt; and The Publisher: Henry Luce and His American Century. For further information regarding programs at The Jewish Museum, the public may call 212.423.3337. Tickets for lectures, film screenings and concerts at The Jewish Museum can now be purchased online at the Museum’s Web site, http://www.thejewishmuseum.org/houdinievents. New Zealand author and poet Lynn Jenner has alerted us to her new book, Dear Sweet Harry, a unique collection of autobiographical stories and poetry that ties her own family history with that of Houdini and Mata Hari. 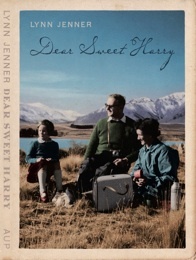 Dear Sweet Harry can be purchased now at Amazon.